It has been more than 150 years since Capt Sir John Franklin and his 128 men perished in the Canadian Arctic, their ships lost in one of the greatest disasters of British polar exploration. Now, a Canadian archaeological team is en route to the Arctic in a fresh hunt for Franklin's ships. 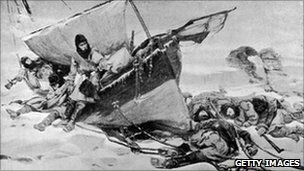 Relying on 150-year-old testimony of indigenous Inuits and 21st-Century methods like sea-floor surveying, the team hopes to find HMS Terror and HMS Erebus and discover once and for all the fate of the men - who are believed to have succumbed to scurvy, hypothermia and even cannibalism before they perished in the frozen Arctic. The expedition by Parks Canada, a Canadian government agency, comes amid Canada's increasing efforts to assert sovereignty over the waters of the Northwest Passage, which is increasingly navigable for longer periods during the summer. 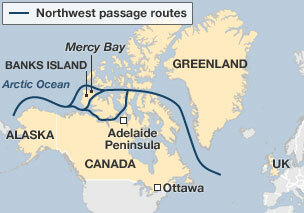 This sea route is the same one Franklin and his men set out to find in 1845. The expedition will also be the first to search for the ship sent to rescue Franklin, HMS Investigator. Parks Canada underwater archaeologist Ryan Harris and his boss Marc-Andre Bernier have been pondering the fate of Franklin and his crew while examining maps of the Canadian Arctic at their Ottawa headquarters. Aiding in their search are underwater archaeologists Jonathan Moore and Thierry Boyer. Remarkably, the crew of the Investigator survived. "The Investigator promises to tell its own stories!" says Mr Harris. "Our job is to understand and make those objects speak," adds Mr Bernier, "and that's what's fascinating."